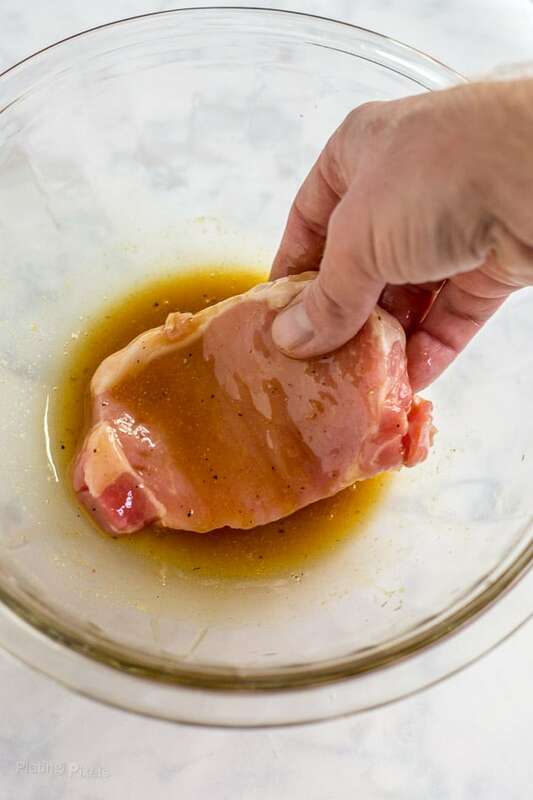 Honey Mustard Sheet Pan Pork Chops makes a quick and easy-to-clean weeknight meal. 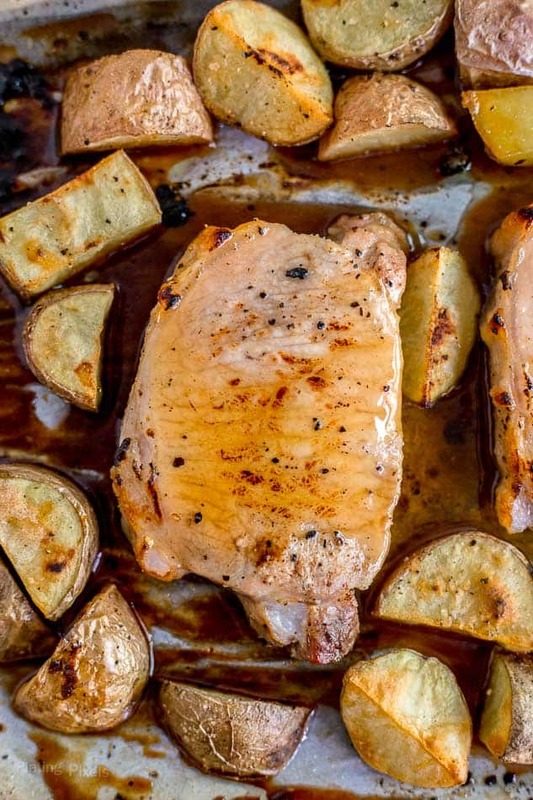 Boneless pork chops soaked in a sweet and tangy honey mustard sauce, then roasted with potatoes on a sheet pan. With a full-time job and a long commute, free time has become a lot more sacred. Luckily I can still enjoy cooking recipes like this Sheet Pan Pork Chops, even with a crazy schedule. I’m excited about a much-needed break with an upcoming trip to Belize and Guatemala for 10 days. Besides plenty of sight-seeing and activities, I plan to experience lots of local food. It’ll be a great way to expand my cooking knowledge and share some Central American-themed recipes. Sheet pan pork chops is a quick and easy meal with minimal cleanup, no matter how busy you are. There’s something about the cool weather that encourages cozy nights. Besides a quick pre-marinade in a mixture of honey, brown mustard, vinegar, and spices, it’s as simple as roasting on a sheet pan in the oven. Pro Tip: You can even cook the potatoes on the same sheet. Cutting the potatoes into cubes speeds up roasting time, plus creates more surface area for browning. Stir together honey, mustard, vinegar, red pepper, salt, and black pepper. Reserve ⅓ cup of mixture and set aside. Trim any excess fat from pork chops. Dredge both sides of pork chops in the mixture and let sit at room temp. 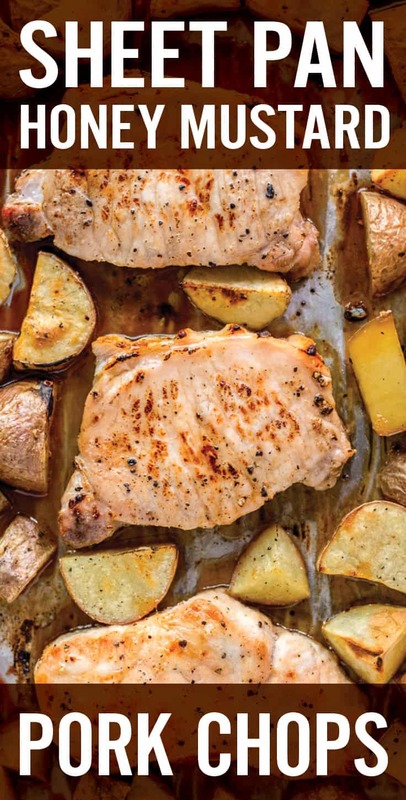 Add prepared pork chops to baking sheet with potatoes in a single layer, bake until pork reaches an internal temperature of 145° and potatoes are tender. Remove from oven and let sit 5 minutes. Serve with remaining honey mustard mixture drizzled on top of pork chops. Give them a head start with high heat, then reduce a bit and continue cooking with the pork chops. The high heat helps give the potatoes a crispy outside and also allows them to start cooking ahead of the meat which doesn’t take as long. By doing it this way everything is ready and cook perfectly at the same time. It’s a simple weeknight meal that’s gluten-free, free of processed ingredients and ready in about 40 minutes from start to finish. Pair this with your preferred cozy weather activity for a unique home dinner night-in. Pork chops are cut from the pork loin and are usually around 1/2-1 inch thick but you can often choose your preferred thickness at your butcher. Bear in mind that the thickness will affect the cooking time. You can buy boneless or pork chops on the bone but I usually always go for boneless pork chops and it’s what I recommend for this recipe because they’re quicker to cook. Pork chops are a great alternative to chicken or red meats when you want to switch things up. It’s really affordable meat and it’s low in fat so can be eaten as part of a healthy balanced diet. Leftover pork can be chopped up and added to salads or stir-frys. 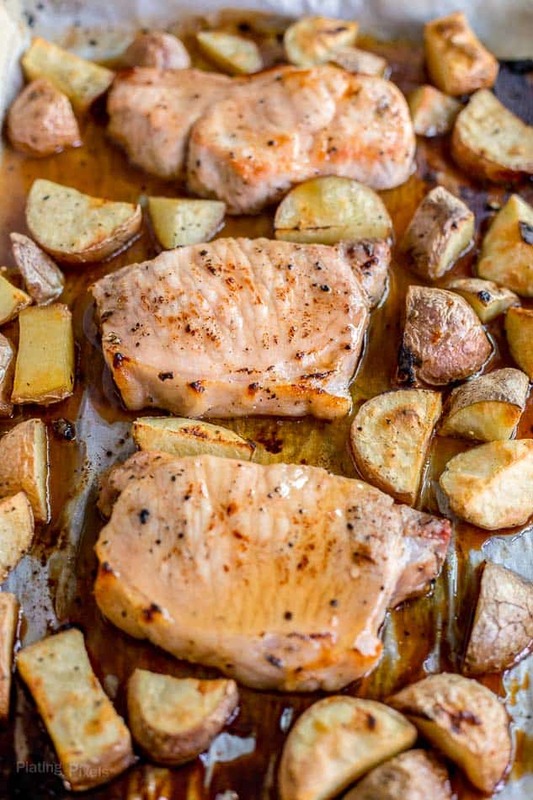 Boneless pork chops soaked in a sweet and tangy honey mustard mixture, then roasted with potatoes on a sheet pan. In a large bowl stir together honey, mustard, vinegar, red pepper, salt and black pepper. Reserve ⅓ cup of mixture and set aside. Trim any excess fat from pork chops. Dredge both sides of pork chops in mixture and let sit at room temp 20-30 minutes. Meanwhile: Preheat oven to 425° F. Wash and cut potatoes into ½-cubes. Toss with olive oil and salt and pepper to taste. Evenly spread on a large parchment-lined baking sheet. Bake 15 minutes, then reduce heat to 400°. 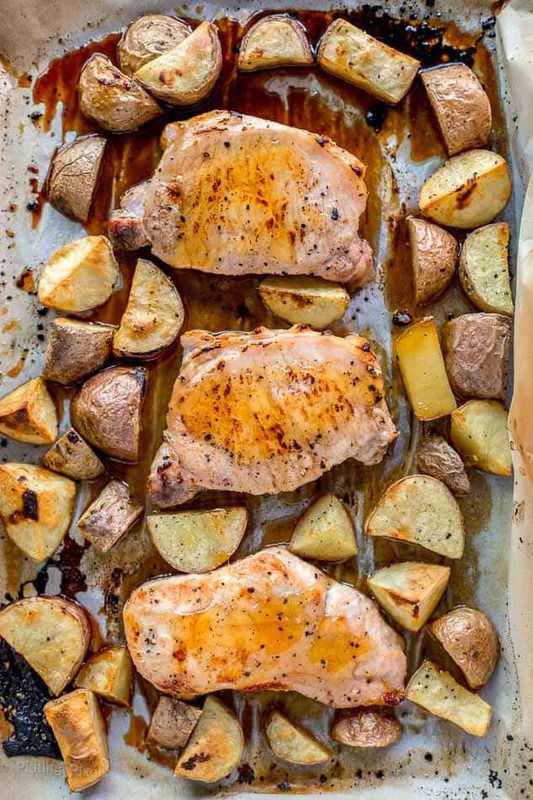 Add prepared pork chops to baking sheet with potatoes in a single layer, bake 7-10 minutes more, or until pork reaches an internal temperature of 145° and potatoes are tender. Remove from oven and let sit 5 minutes. Serve with remaining honey mustard mixture drizzled on top of pork chops. Remember to follow my instructions for cooking the potatoes ahead of time so everything is ready at the same time, you don't want undercooked potatoes.